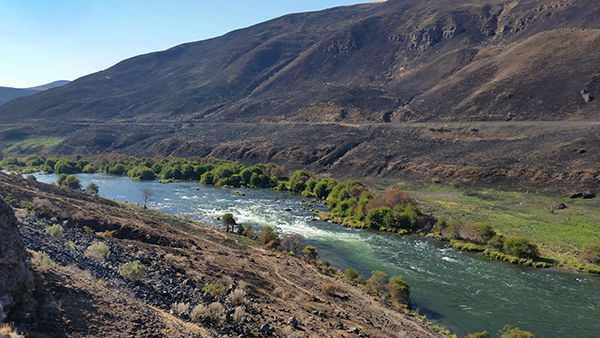 The Deschutes River is well known as a classic trout, steelhead and salmon fishing river in eastern Oregon. Kind of a “River Runs Through It” scenario but there are plenty of guided river trips with small tent camps on the river banks supplied by raft and boat. No fishing from boats on the Deschutes River. On the east side of the Deschutes River is the Deschutes River Trail. It’s more like Deschutes River Dirt Road. I’ve seen cyclists on cyclocross bikes or gravel grinders, whatever they call them these days, but you would have to pay attention. 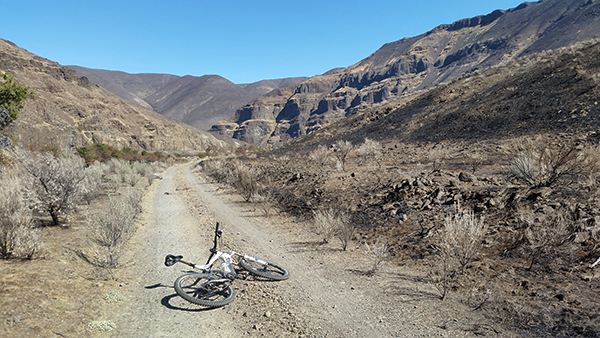 A mountain bike allows you to check out the great scenery, of which there is plenty. There was a good deal less nice scenery this time around due to a very large wildfire. The entire east side of the river is burned to ashes all the way down to the river. All the old “wild west” buildings are gone, burned to the ground. 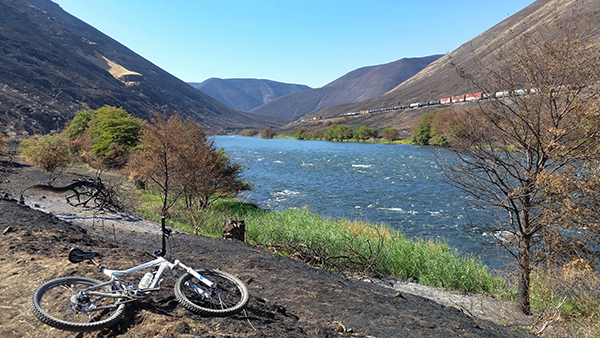 We rode fifteen miles along the Deschutes from the rivermouth on the Columbia River and did not reach the end of the burned area. We will be having more cycling adventures shortly so check back soon.